So many many things to say about this little recipe. Starting with the fact that it is basically a loaded bagel with cream cheese, but in pizza form. 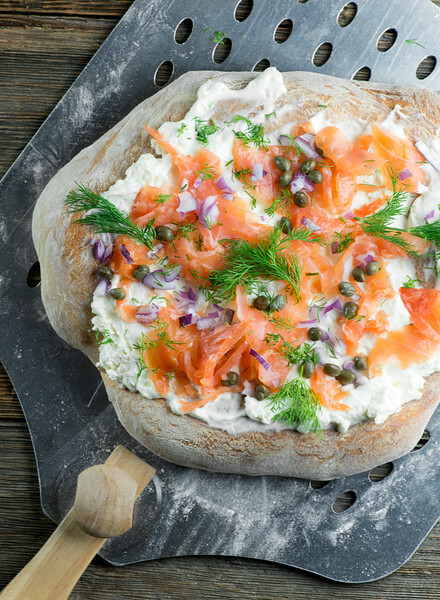 And since my love for a bagel slathered with cream cheese and smoked salmon and other goodies runs neck and neck with my love for pizza in pretty much any form, this concoction pretty much leaves me weak in the knees. Second, it is SO easy to make that it almost doesn’t seem fair. And third, it gives me a chance to show off my adorable cutting board from Vermont Creamery. But more on them later…let’s make pizza!Start with some fresh pizza dough…either homemade or the kind you can buy in the refrigerated section of your grocery store. My current favorite homemade pizza dough recipes are this one from the New York Times, and this one from the fabulous Simply Recipes. Both are easy to make and consistently produce wonderful, crusty, chewy pizza dough. But if you decide you need this pizza asap, and I will totally understand why, the store variety is A-OK too. Form your dough into a 10-12 inch circle (and don’t worry about being too precise) and bake it in a hot oven until it is just starting to turn golden. Once it comes out, you want to immediately slather it with whipped cream cheese. The heat of the crust is going to make the cream cheese just the perfect amount of creamy and melty. Now drape some slivers of smoked salmon on top. My supermarket sells little containers of what they call smoked salmon ends, which are perfect for this, but you can also buy a packet of smoked salmon and just gently tear it up. Now scatter on some capers, a little chopped red onion and some fresh dill. And voila! Your favorite bagel experience but in pizza format. Creamy and salty and chewy and tangy and yay! As for the Vermont Creamery part, they sent me that sweet cutting board when I won a photo contest that they ran, and it was just the right size for my pizza slices. And it made me think that the next time I try this, I might swirl the cream cheese with a little bit of their wildly good creme fraiche. I like to walk on the wild side – pizza-wise, anyway! Now go bagel up your pizza, please. 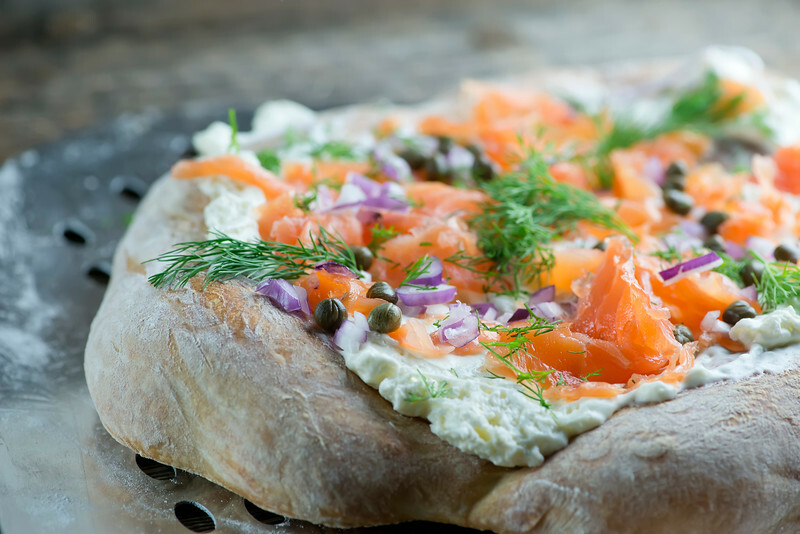 All your favorite bagel toppings meet pizza in this fun and easy recipe! Preheat oven to 500. Roll pizza dough into a roughly 10-12 inch round shape – don’t worry about getting too precise! Place on a pizza stone or a baking sheet and bake until just turning golden, about 10-15 minutes. Remove from oven. Quickly spread pizza with the cream cheese. 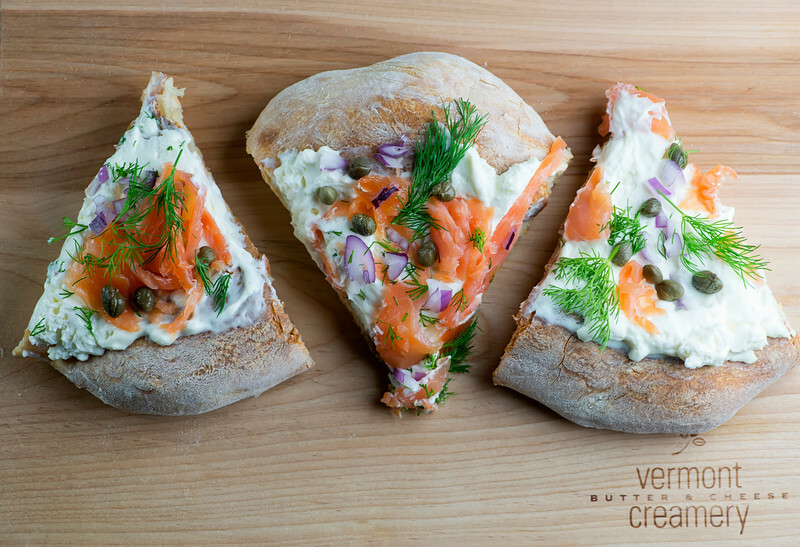 Lay the salmon slices on top of the cheese, and garnish with as much red onion, capers and dill as you like. Cut into slices and serve at once.